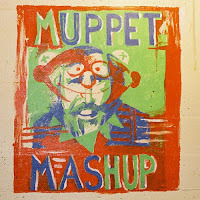 Mashups, remixes, and covers of music from The Muppet Show and Sesame Street. Compiled by Boston's djBC. Features RIAA's "Spinning Rubber Sing Thing," which features "Sing," "Rubber Duckie," The Shagg's "Shaggs Own Thing," John Cale/Brian Eno's "Spinning Away." Also: great tunes from Martinn, ATOM, Dunproofin, and bc hisself.